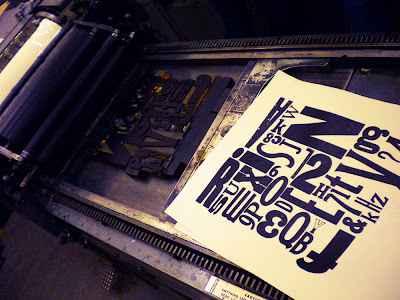 Our final woodblock letterpress class at the Dawson Printshop was a couple weeks ago and I never finished my blog posts to show the final results! Better late than never. I was using the Kelsey parlor press to make notebook covers. 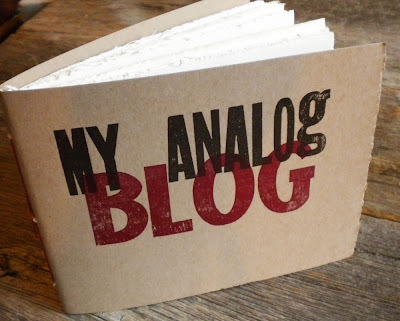 I printed them in two colours, first "My Analog" in dark brown then "Blog" in dark red. I made several of these so I'm selling them on Etsy if you like it! 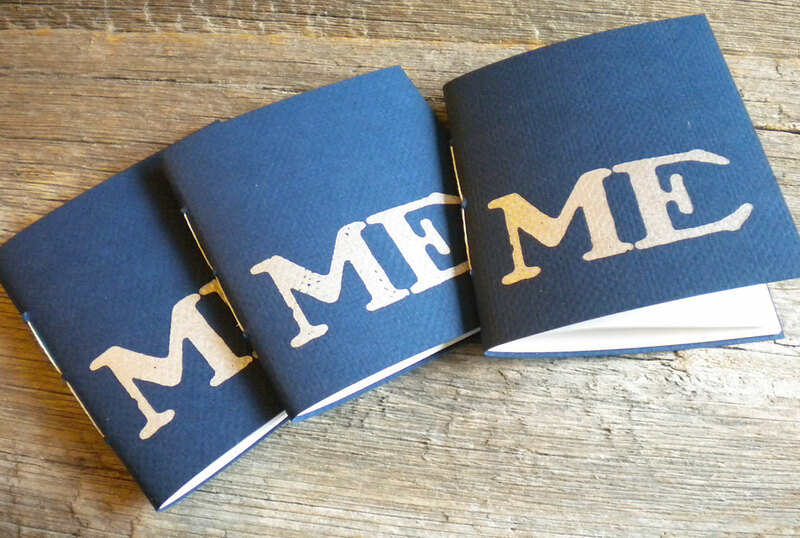 Another night, I was waiting to use the proof press and passed the time by using the parlor press again, printing a few more notebook covers that have a silver "ME" on them. I really like this font. The final project that I did in class was assembling and printing this collage of many woodblock fonts. It is just a jumble, don't try to make it say anything clever, it is just letters A to Z and numbers 1 to 9 and a few punctuation blocks, arranged on the bed and printed all in one colour. I might use these as decorative papers in bookbinding; that's the plan right now, although I haven't done anything with them yet. Thanks Niko, for a great introduction to letterpress! Lovely results from your class! I would so like to do a similar class myself... I'm saving up for a press but it's going to take a while... I have a teeeny letterpress adaptor for a die-cutting machine, but only limited letterpress plates - need to work out how to make suitable blocks for myself. The collage is lovely - hope you printed lots! and thanks Ronnie, we are very lucky to have the Dawson Printshop here!